PBT 2400 Power Chi Booster Transfer - Life Quest® Formulas, Inc.
Made of our Super-Orgonite® composite material that is significantly more powerful than the original orgonite®. It will more than triple the output power of the JU 99 CE and it effectively doubles the output of any middle of the line device (such as the LPOG 2400 DL), while adding strength to the top of the line Heavy Duty Chi Generators®. A built-in structural link connects the Transfer Disk with its -unique- Power Booster. The PBT 2400 as well as the PBT 2400 HD come with a Transfer Disk. This Transfer Disk will give you assured smoother transfer of life energy at any distance without loss. The PBT 2400 Power Booster and the PBT 2400 HD Power Booster for HD-Devices The Power Boosters of the PBT 2400 series are made of our Super-Orgonite® composite material that is significantly more powerful than the original orgonite®. Therefore it will more than triple the output power of the JU 99 CE and it effectively doubles the output of any middle of the line device (such as the LPOG 2400 DL), while adding strength to the top of the line Heavy Duty Chi Generators®. The PBT 2400 as well as the PBT 2400 HD come with a Transfer Disk. This Transfer Disk will give you assured smoother transfer of life energy. A built-in structural link connects the Transfer Disk with its Power Booster. 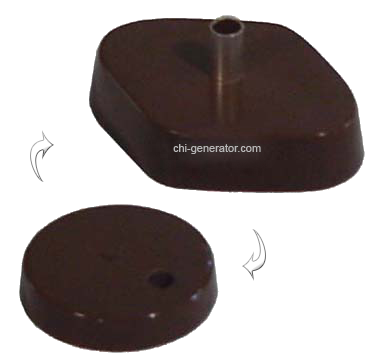 Uses: Carry the Transfer Disk on you while your Orgone Generator® or Orgone RadionicsTM Device with attached Power Booster is in your home. With this simple arrangement, you can carry the energy of your Orgone Generator® with you - any place on the planet and any place in the universe!